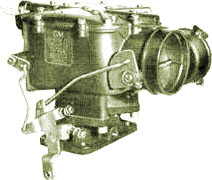 The Rochester AA was as an unusual two barrel downdraft carburetor used on the 1949 and 1950 Oldsmobile Rocket 88 and 98. It has very little in common with other Rochester carburetors. The AA carburetor has a horizontal air inlet and is a bit reminiscent in layout of the Holley 885 used on 1949-1951 Mercury V8's. These are hosted by The Old Car Manual Project.